When you activate the automatic cruise feature, the quadcopter will cruise automatically according to the preset trajectory. One key 360°roll in 3 ways (Backward, Left & Right), continuous roll for perfect action and wonderful performance. The Syma X51 has an unique design. The elasticity of the blade guards prevents damage upon impact, and prevent the propellers from motor damage due to interference. If the quadcopter keeps drifting in one direction and this cannot be rectified using the trim adjustment buttons, the quadcopter needs to be recalibrated. Ensuring that the surface is level. Move the two levers on the controller to the bottom right corner until the quadcopter LED indicator flashes. The quadcopter is now recalibrated and ready for use. AUTOMATIC CRUISE - Turn on this mode and let the remote control drone spin and fly in the air on a preset trajectory. Enjoy the pilot experience as the drone simulates auto-pilot for short periods so that you can marvel at its flight path. ONE KEY TRICKS - Easily perform tricks with the one key 360°roll. A great drone for kids to perform continuous aerial maneuvers like rolling backward, left, or right. 6 AXIS GYRO - The 6-axis flight control system increases stability to take this indoor drone, outside, as it can fly against light winds. LED LIGHTS - Fly your drone at sunset to see the contrasting colors of the drone's illuminating LEDs agianst the orange glow of the sky. Easily keep track of your mini drone in the dark with the unique spaceship design and UAV LED lights. SPACESHIP DESIGN - An easy to fly drone with a lightweight and durable frame that's fun to fly. Includes a bonus battery to double the flight time. 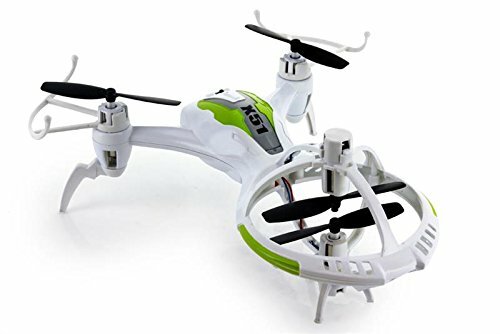 Makes a great gift drone for a first time beginners interested in aviation.